1982 Suzuki RM125Z. Very nice and super LOW hour bike. Bike is still on standard bore, I purchased from the original owner where it sat in his garage for all these years. The bike had the original tires on it when I brought it home. Frame has been powder coated, all hardware has been re-zinced, Aluminum has been polished, new bushings in the swingarm, Forks were disassembled and new seals/fluid. Rear shock has been rebuild by Y&S racing. Motor has been untouched other than removing the head to verify it’s standard bore status. Bike starts right up and runs great! Everything sounds nice and tight, just as it did on day one! No oil in the water/no water in the oil. Still has the orignal sprockets with no wear (see photo) Very little carbon (almost none) in the perfect silencer. 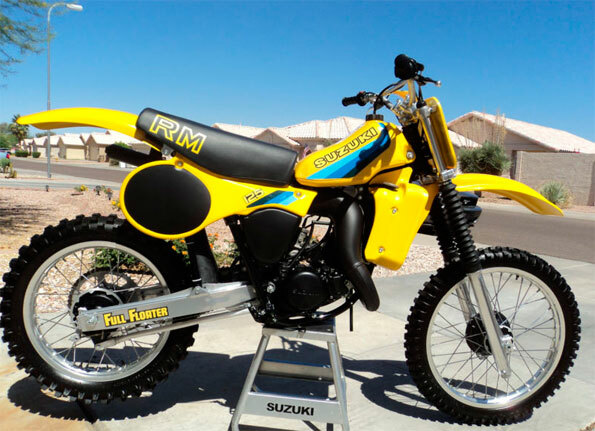 All new cables, plastic,tires, etc… Good luck finding a nicer 1982 RM125 with less time on it!